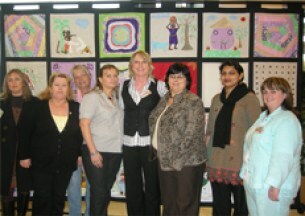 The Intercultural Quilt was designed and completed by the Roscommon Intercultural Women’s Group. 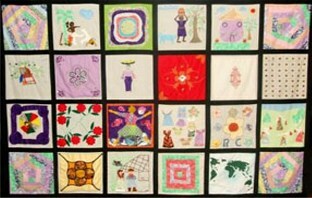 26 quilters from very different cultural backgrounds came together to sew the quilt and raise awareness for the UN International Day for the Eradication of Poverty Oct 17th. The quilt was funded by the Combat Poverty Agency and the Roscommon County Development Board. Jim Higgins MEP then invited the Roscommon Intercultural Quilt and eight of the women who were involved in creating the quilt to Brussels on 4th and 5th of November 2008 to participate in the Intercultural Ireland concert and conference.